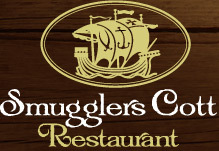 to the official website of the Smugglers Cott Restaurant East Looe. famous backstreets 100yds from the Seafront, the Smugglers has been serving quality food for over 50 years with a ledgendary 600 year old History. The 65 seater Restaurant specialises in Local Seafood and Prime Steaks along with its now famous Carvery. Open throughout the year apart from two weeks in January. We are occasionally closed for staff training days and maintenance, please check in advance to avoid disappointment. Famous Carvery served Sunday Lunchtimes 12.00 - 2.00pm. Reservations can be made on tel: 01503 262397. We are unable to take reservations over the internet. © 2012 Smugglers Cott Restaurant.